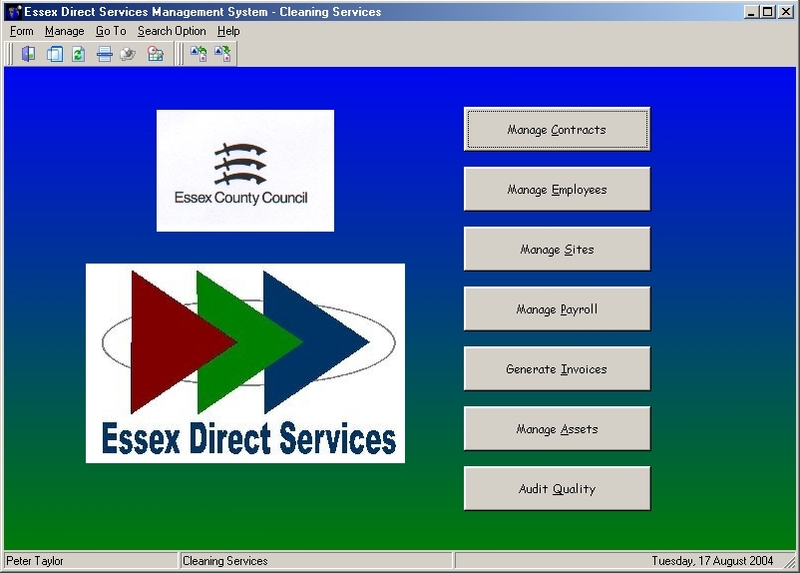 Download the case study of our work with Essex County Council (in Word format). Essex Direct Services (EDS) provides market leading cleaning, grounds maintenance, transportation and reprographics for Essex County Council. The division employs 1,000 people, mostly on a part time basis. The first phase of the project focussed on cleaning contracts, primarily of schools and libraries. EDS manages over 300 cleaning contracts using approximately 800 part time cleaning employees, managed by 4 Contract Managers. Paper based attendance sheets are completed by each Contract Manager every fortnight and submitted to payroll for keying into the payroll system. Contract Managers also audit sites regularly and file results for future reference. All equipment and machinery is logged using a central register, maintained at head office. Graeme invited SolarSys Consulting to analyse the current processes and to recommend specific solutions to achieve his objectives. SolarSys recommended the introduction of its Direct Services Management System to capture all key information into a database that would allow automatic functions to be performed such as reporting, analysis and contract management. SolarSys managed the project from initial specification through implementation, user training and system deployment. In effect, a turnkey solution that required very little demands on EDS personnel. Ongoing support for the solution is also provided along with system enhancements as required. Through the introduction of the Direct Services Management System, EDS is now better equipped to maintain a consistent high quality service across all its contracted sites and to demonstrate best value service provision to its customers.